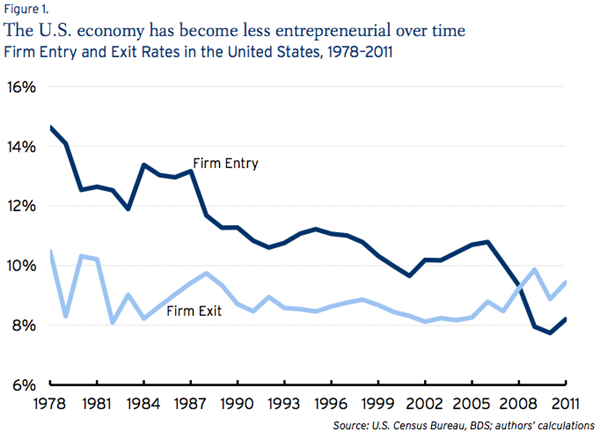 Many of you are STILL in denial and think America’s struggle is based on Blue vs Red, but the latest Brookings Institution report about the decades-long destruction of business creation and survival should make you see a bigger picture. And be very pissed. Does this look like a political war of colors to you? 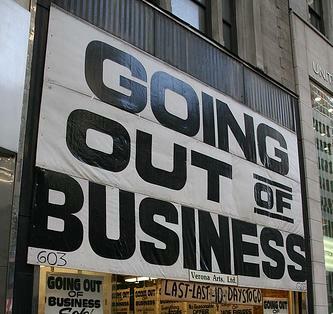 This steady destruction of businesses and entrepreneurship happened for DECADES, regardless of the party in control of Washington. Once again, we’re being played. If you believe – like most politicians during an election year – that small businesses are the economy’s growth engine, then it’s quite easy for you to understand that the middle class is screwed. And the poor have nothing to celebrate about either. The logical question becomes: “How can anyone hope to achieve or maintain a middle class lifestyle when one of the most important vehicles for creating a middle class has gone to the crapper? Combine this reality with a larger population – many of whom are able-bodied adults – that has to be supported by a shrinking labor force or the government, evaporating net worth, and equally shrinking wages among middle-income earners. What kind of ugly future for America do you see?. Part of that future will apparently include an increasing dependence on big businesses to deliver products and services to society. The future also means that families in need of wage earners and wealth builders will have to depend on large businesses. Y’know, like in an oligarchy. Another logical question to ask is “What role has the government played in creating this downward spiral? Uncle Sam’s recent Too Big to Fail treatment of banks is only a recent example of many. This entry was posted in Uncategorized and tagged brookings institution, Economy, Politics, small business. Bookmark the permalink.